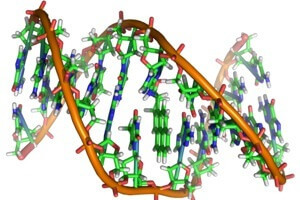 Only about two percent of the human genome contains genes. The other 98 percent has been likened to cosmology’s dark matter that fills the space between stars – there’s a lot of it, but nobody really knows what it does. Over the years scientists have put faith into the logic of evolution: if it’s there, it must serve a purpose. But a recent study shows that not all genomes are created equally. Unlike human genomes, the carnivorous bladderwort’s genome makes the most of its allotted bases having only an estimated 2 percent of non-coding DNA, or so-called “junk” DNA. The genome of the carnivorous bladderwort plant (Utricularia gibba) is minuscule compared to the human genome – 82,000 bases versus our near 3 billion. But while it’s small, the genome is extremely efficient. About 97 percent of its genome codes for an estimated 28,500 genes and the short sequences that control those genes. The authors of a study mapping the bladderwort genome surmise that, through many generations, the non-coding portion of the carnivorous bladderwort’s genome has been systematically removed, resulting in just 3 percent of non-coding DNA. Non-coding DNA is DNA that does not code for proteins, the structural building blocks of the body. Their stretches of non-protein coding DNA contains the all important regulatory sequences that control when and where genes are turned on and off, areas that produce non-coding RNA, the function of which largely remains a mystery, and introns, those good-for-nothing wastes of space. But while it’s not clear what purpose the non-protein coding regions of the genome serve, they’ve generally been assumed to have some useful function – evolution is driven by the selection for survival, how could it make junk? The current study, conducted by the Laboratorio Nacional de Genómica para la Biodiversidad (LANGEBIO) in Mexico and the University of Buffalo, however, reaches a different conclusion. The human genome also went through a phase of simplification – in 2004 when it was shown to have about 20,000 to 25,000 fewer genes than scientists originally thought it should have. Still, at about 40,000 times the size of the bladderwort genome, it’s vastly more complex. Which is why we shouldn’t automatically assume our genome works the same way. Human physiology is much more intricate than that of the bladderwort. With all its different organs and cell types and the unique functions they serve, it would be shortsighted to conclude that the trimming which resulted in the bladderwort’s genome is a general evolutionary rule. That is, if the human genome were to trip the non-coding fat, it would still give us the diverse physiology our bodies require. Counter to this idea are recent studies put forth by the ENCODE, a National Human Genome Research Institute project that seeks to identify all the functional elements of the human genome recently published a series of studies that send a clear message: it ain’t junk. The studies reach the collective conclusion that 80 percent of the genome actually does have important function – they don’t code for genes, but rather, affect the different biochemical processes that occur in cells. The bladderwort is interesting, not only for its highly efficient genome, but all carnivorous plants are, by definition, awesome. The aquatic plant is found on all continents except Antarctica. Its water-filled bladders act as traps, sucking in small insects unlucky enough to contact the bladder and trigger it. And while the meat-eating green has done away with its non-coding DNA, one species’ junk could be another’s treasure. Projects like ENCODE that explore the genomes’ dark matter will bring its function – or lack thereof – to light. Genomic divergence of the two species could be a true mark of different evolutionary paths such that an almost entirely coding genome might reveal something about, not only our very non-coding genome, but the fundamentals that underly the evolution of all life.